Product prices and availability are accurate as of 2019-04-14 03:38:37 EDT and are subject to change. Any price and availability information displayed on http://www.amazon.com/ at the time of purchase will apply to the purchase of this product. 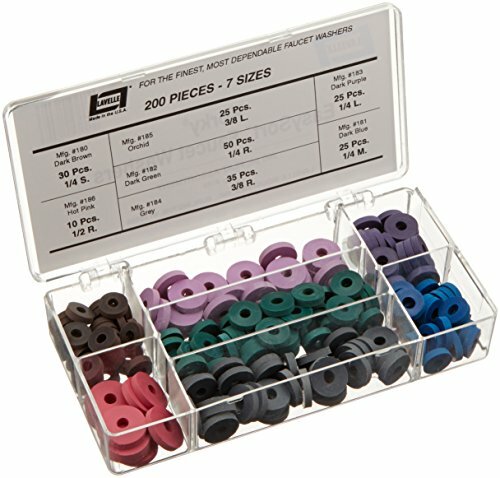 The Flat Faucet Washer Kit contains 200 assorted faucet washers in 7 different sizes. The kit includes: (1) Box, (30) 1/4" Small Flat - Brown, (25) 1/4" Medium Flat - Blue, (50) 1/4" Regular Flat - Green, (25) 1/4" Large Flat - Purple, (35) 3/8" Regular Flat - Grey, (25) 3/8" Large Beveled ? Orchid, (25) 1/2? Regular Flat ? Pink.